Benaroya Research Institute at Virginia Mason (BRI) has been a Union Bank customer for almost a decade – but to BRI, Union Bank is more than just their bank. 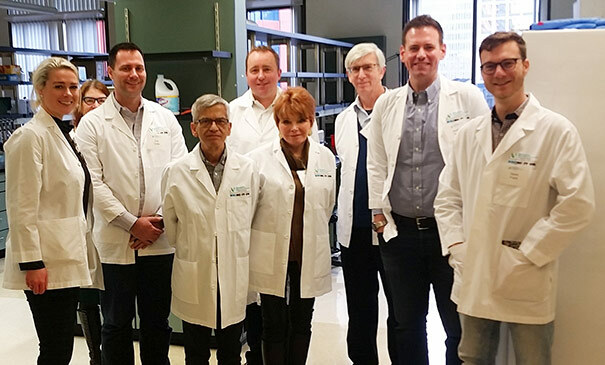 It has been a steadfast financial supporter for seven years, helping the research organization pursue cures for autoimmune diseases, allergies, cancer and more. This year, Union Bank was the presenting sponsor of BRI’s annual Illuminations Luncheon fundraiser. The event raised $170,000 and connected BRI with over 130 people interested in donating blood to their biorepositories. BRI researchers study these blood samples to learn more about the immune system and immune-related diseases. As a sponsor, Union Bank helped cover the event’s costs, which means more of the proceeds go to BRI research. “We like to support Illuminations because it helps fund research for lifesaving cures and it spreads the word about BRI to new supporters,” says Matthew, who was among a dozen Union Bank employees at the luncheon. Matthew and his team don’t only support BRI financially; they’re also engaged in BRI’s work. He and a colleague recently attended one of BRI’s “Science Friday” events where researchers offer lab tours and share their work with the public.